It’s genuinely hard to write a review of a movie as simply good as Wreck-It Ralph. The characters are fantastic. It passes the Bechdel Test. The story is well-written and never lags. It’s funny. It’s got great references. It’s original. It’s relatively unpredictable. I like it. None of these things (sadly) are conducive to an actual review. 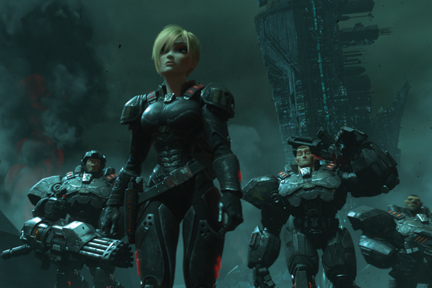 Fortunately the movie also had a really thought-provoking theme, so we’re going to tackle that. The film deals with issues of fate, identity and the nature of evil, which is pretty heavy for a kids’ film, and definitely worth talking about. So thanks movie! 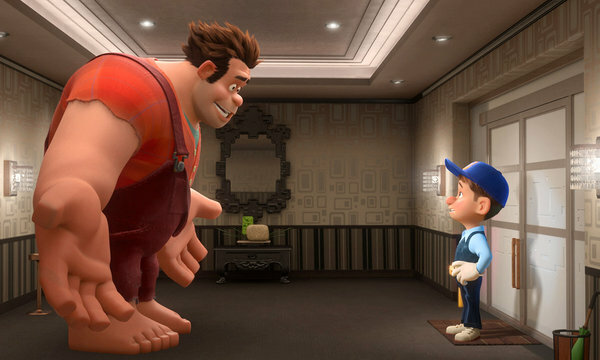 Wreck-It Ralph follows the story of a videogame character, Ralph, who lives in the game Fix-It Felix. Ralph is the bad guy, whose job it is to get mad and destroy this apartment building so that Felix can fix it with his magic hammer. It’s an eight-bit old arcade game, and when we start the movie, the game is just celebrating its thirtieth year. Since Ralph is the villain of the game, he lives secluded from the other game characters. He has to live in the dump, and they all run from him when he comes near them. That makes him upset, because it’s not his fault he was programmed to be the bad guy. It’s literally in his code, and it’s his job to destroy the building. But that’s not who he is. So Ralph goes on a journey of self-discovery. What he really wants is to get a big shiny medal and prove that he can be the hero, because then the other characters in his game will have to respect him. Of course he doesn’t get what he wants, or rather, he does and then discovers that it wasn’t what he needed. Without giving any spoilers (which is very hard and I do it all for your benefit so you’re welcome), Ralph deserts his own game and goes into a couple of other games, looking for the respect and admiration for being the good guy that he’s never been able to find in his own life. Along the way he learns, grows, and becomes more confident as a person. He also (SPOILERS) becomes okay with being the bad guy. And that’s what I find so very interesting about this story. It’s incredibly rare to see a story these days, at least one that comes out of the Hollywood animation industrial complex (I just made that up), that focuses on the good of the many rather than the good of the whole. That’s what this movie teaches, though. Ralph has to give up his dream of being a hero for the good of everyone. And that’s okay. Let me back up. Now that we’re in spoilers territory, I can tell you that in his search for a medal, Ralph invades a first person shooter game about swarming evil bugs, and actually does manage to get a medal. But in the process of getting that medal, he accidentally awakens the evil bug, and in the fight, he and the bug are transported to yet another game, this one a cute little racing game called Sugar Rush. Most of the rest of the action takes place here. Ralph tries to retrieve his medal, but it’s stolen by the incredibly precocious Vannellope Von Schweetz, a glitch in the system of the racing game who just wants to be able to race like a real playable character. She knows she can race. Racing’s in her code. Not to give the whole thing away, but as a result of Ralph’s actions two things happen: the game of Sugar Rush is going to be destroyed by the alien bugs, and Ralph’s own game is going to be unplugged and destroyed. After all, what’s a game without the villain? 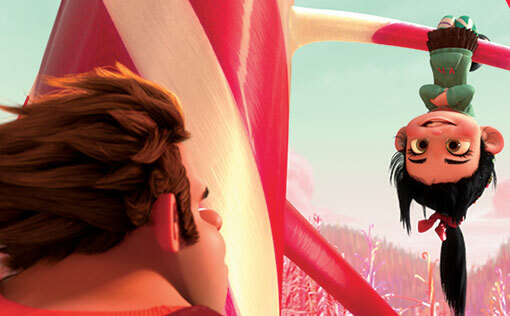 Ralph now has to save the day, saving not just his game, but Vannellope’s as well. And it’s sweet and touching and truly heartwarming to see how he does it. He really does prove that he’s a hero. And he does it by being himself. But in the end, Ralph goes back to being the bad guy in his game. It’s a good thing, because otherwise the game would have been destroyed and all of the game characters would have been homeless, but Ralph makes the unselfish decision to help out those who have always spurned him, and save the game. That is downright shocking for a movie in this day and age. As a culture, we are very strongly individualistic. You do what’s right for you, and no one has the right to challenge it because it’s your life, right? 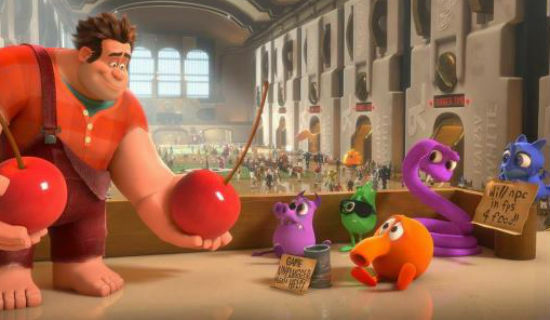 Wreck-It Ralph begs to differ. It says that the things we do have profound implications for those around us. You may not like your job or the things you are asked to do, but that doesn’t mean you shouldn’t do it or that it isn’t a thing that needs doing. 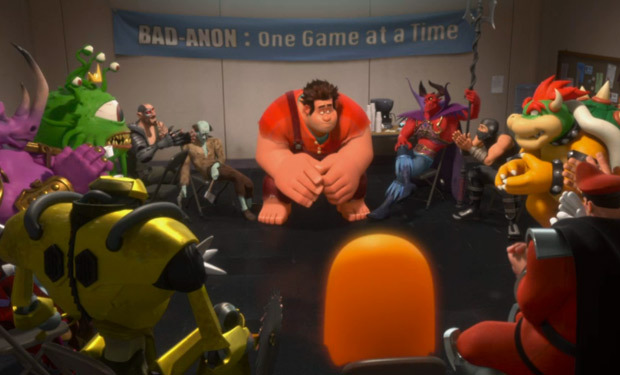 Wreck-It Ralph stresses the importance of the community over the individual. It shows that being a hero is putting others before yourself, but more than that, putting the common good ahead of your own selfish needs. Or even your own legitimate needs. Being a hero is looking out for the good of all. Even when you need to be a bad guy to do it. That’s pretty freaking revolutionary for a kids’ game. And also something I think we could do with more of. Now, Ralph doesn’t get a bad ending or anything. It’s obviously a happy ending, and we know that his relationships were repaired, he did the right thing, we know he’s happy now. But we also know that he went back to doing something he didn’t enjoy just to ensure the well-being of people he didn’t like. That takes real courage. Utilitarianism is something we’re conditioned to scoff at, living as we do in a world that seems powered by individual interest. But maybe we can find something worthwhile in the common good. The idea that we don’t have to be working by ourselves for things. That it’s okay to want community. That being a bad guy doesn’t make you a bad guy. And their parody of FPS games? Dead on.